Master Bedroom with King Bed, AC and full bathroom with soaking tub located on 2nd or main floor. Bedroom 3 located on main or 2nd floor has twin beds and can be pushed together. Looking for your own peaceful hideaway? 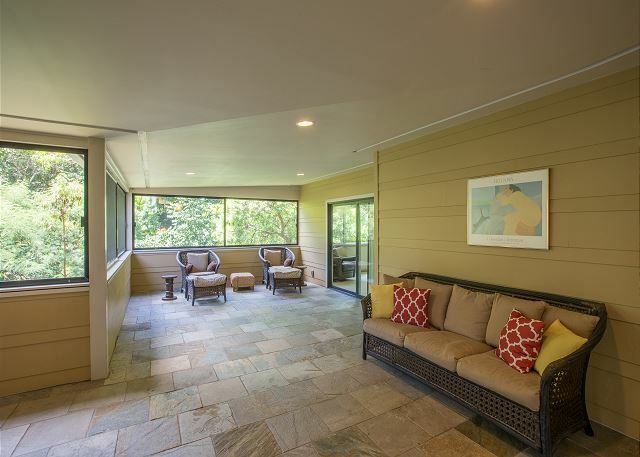 This 3 year new, contemporary home is tucked away in a very private, quiet setting. The home has 4 bedrooms and 3 bathrooms with an open floor plan equipped with air conditioning and a gourmet kitchen that includes a full size, Sub-Zero refrigerator and freezer, microwave, dishwasher, wine cooler, beverage fridge, and high-end gas stove/oven. 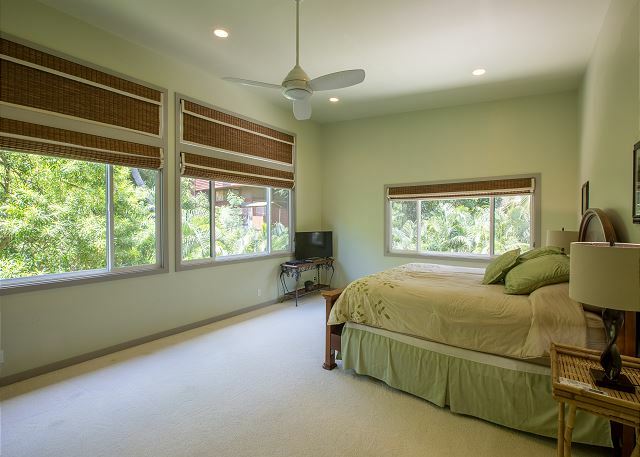 The family room and master bedroom open up to a large, private lanai with peek-a-boo views of the Mokulua Islands. 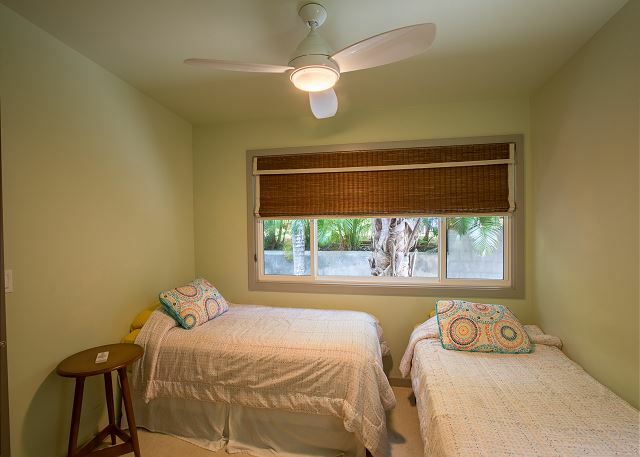 Each bedroom can sleep 2 and is beautifully decorated and furnished. The home is very private and set off of the road to make for a peaceful and relaxing vacation. 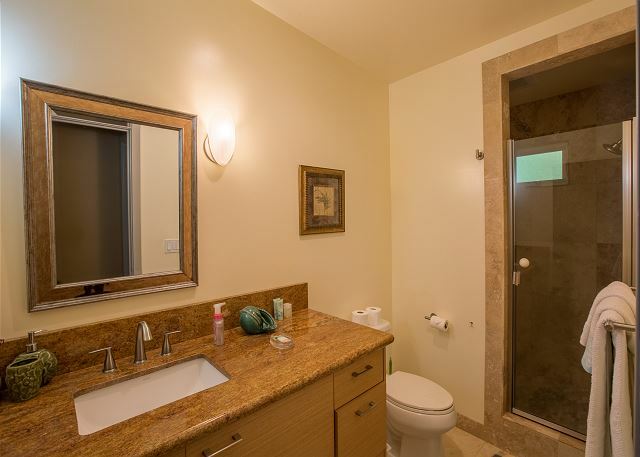 The spacious master bedroom includes a walk-in closet and master bathroom with a Jacuzzi tub and large, open shower. Wake up each morning to singing birds, the cool trade winds, and the beautiful tropical views from every window. Enjoy the famous Lanikai Beach while snorkeling, kayaking, swimming, sailing or simply relaxing on one of the most beautiful beaches in the world. Access to the ocean is just a 2 minute walk from this home or take a 15 minute stroll to the fine, sandy beach of Lanikai. Great experience and great location. House was perfect for 8 of us. Parking for 2 cars and many beach accessories were available. Family Holiday Vacation was good and lovely. We enjoyed the spacious house as we were 5 adults and 3 small children. We liked it was very close to the beach too. We had a great stay. The home is beautiful and spacious. The house was big enough for our 3-family group and very comfortable. The kitchen is particularly nice with a counter for dining and a wonderful screened patio with a big table for another option. There were lots of ocean playthings to use. The picture of the beach access makes the beach look a lot larger than it actually is and doesn't show the rocks in the water. You really need to go further on Lanikai beach or to Kailua Beach Park for actual beach lounging and easy water access. Wonderful location and access to one of the best beaches in America, maybe even the world. Thank you for the ALOHA. We had a great time and thoroughly enjoyed staying here. Beautiful beaches nearby. This was the by far the best stay I’ve had in all of my experiences with VRBO, Airbnb. The house was super clean and everything was functioning. The host was very attentive and responsive whenever I had a question. All of the pictures shown in the advertisement was on point. I absolutely loved the kitchen and the open concept feel to the house. I would definitely recommend this place to all my friends and family. Anytime I’m back in Honolulu, I will be looking for availability at this place again. We very much enjoyed our stay at Hidden Paradise! It was our family's first visit to Hawaii, and the location of this property was ideal for all of our planned adventures. Access to the beach and lovely town of Kailua was very convenient. We also appreciated the option to rent beach cruisers from the property managers, who delivered them to us personally. Highlights of our stay included several sunrise viewings at the beach, hiking the Lanikai Pillbox trail, kayaking out to the Mokulua Islands, daily shave ice treats, Thursday night Kailua Farmers Market...also, this location was a convenient drive to either Honolulu or the North Shore, both of which we visited. 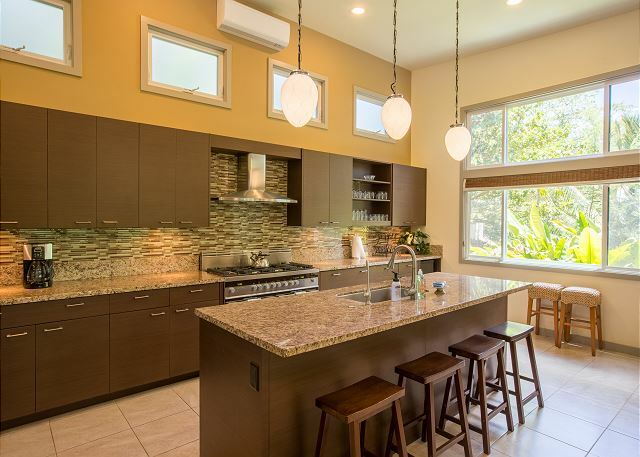 The house had plenty of room for our extended family of 7; the gourmet kitchen was great, as was the lanai area. Kawika and Kepola were both very helpful with suggestions of restaurants and places to visit; we appreciated their quick responses to any questions that came up during our stay. 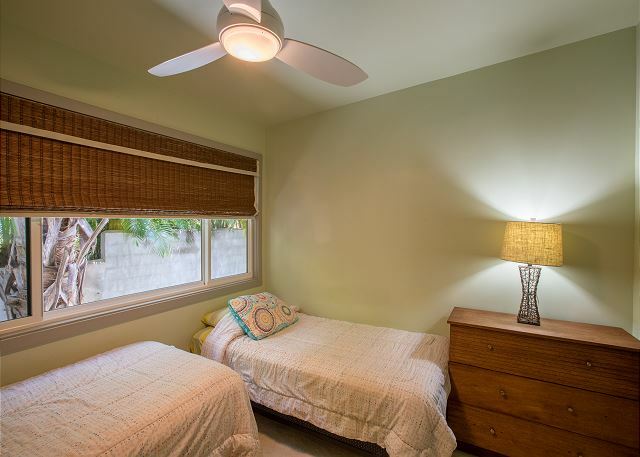 Very highly recommend this property for a peaceful and lovely visit to Kailua! We had a great stay at this beautiful Lanikai home. The rooms are spacious and very comfortable, and we loved sitting on the screened porch every morning and evening. We loved going to the beach, which was only a few blocks from the home! The property managers were quick to respond to any questions we had and easy to communicate with. We highly recommend this home and would stay here again on our next visit to Oahu. 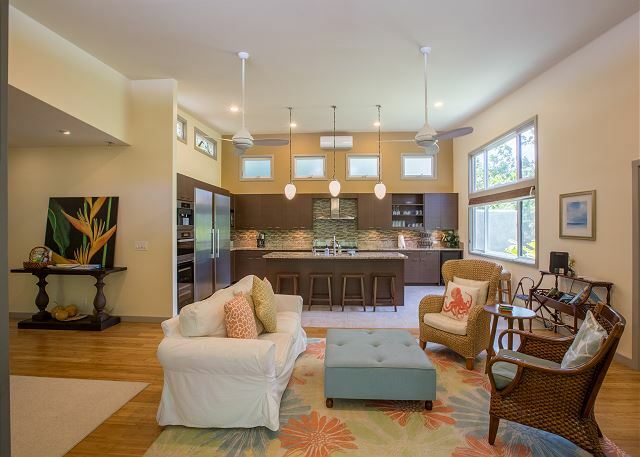 Hidden Paradise is by far the most modern/updated home in Lanikai! We loved the high tech appliances, bamboo floors and the property managers (Kawika and Kepola) were very helpful and friendly! 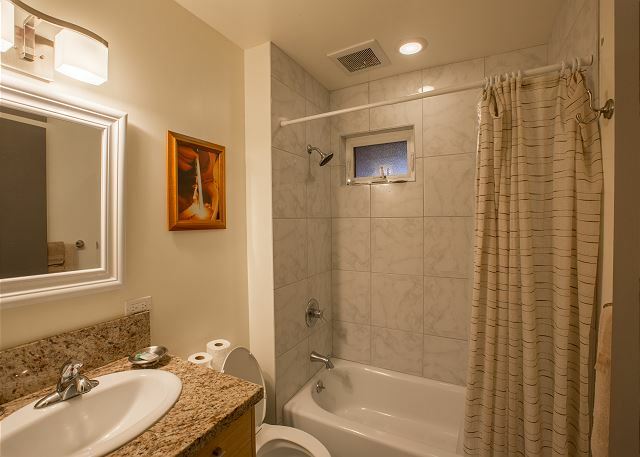 if you are looking for comfort with the feeling of nature and tranquility THIS is the HOME for you. The beach you see in the picture is right down the street and the home is tucked away in pure serenity. Two beautiful worlds for the price of one vacation getaway! LOVED IT! Also want to publicly thank the property managers Kawika and Kepola for making our stay enjoyable. What a great time we had at Hidden Paradise. Great location, beautiful clean house, helpful property staff, highly recommend. 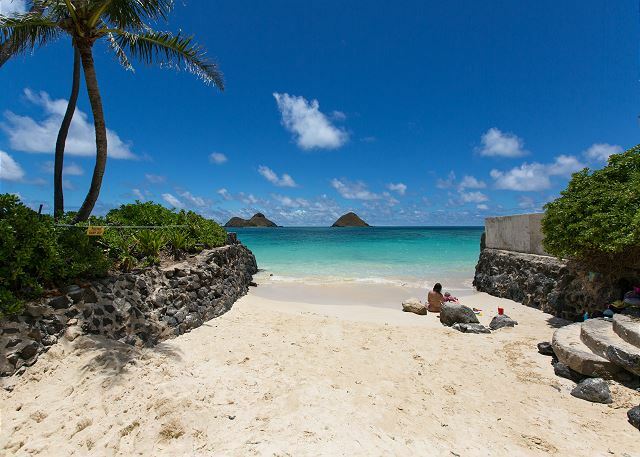 Cannot beat the location, short walk to Lanikai beach, quick drive to Kailua beach. Get place to relax and get the full Hawaii feel.